Permits picked-up on or after August 15, 2018 will be assessed new parks rate. Sec. 2-237. – Computation of amount. 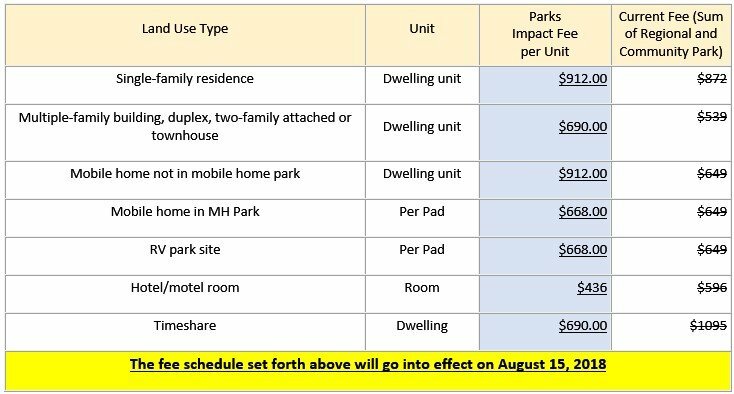 At the option of the fee-payer, the amount of the parks impact fee may be determined by the schedule below. The reference in the schedule to recreational vehicles refers to the number of recreational vehicle sites which are permitted by the applicable final development order. The fee schedule set forth above will go into effect on August 15, 2018. The fee schedule in effect prior to this ordinance will remain in effect until close of business, Tuesday, August 14, 2018 when the new fees take effect. When change of use, redevelopment or modification of an existing use requires the issuance of a building permit, mobile home move-on permit or recreational vehicle development order, the parks impact fee shall be based upon the net increase in the impact fee for the new use as compared to the previous use. However, should the change of use, redevelopment or modification result in a net decrease, no refunds or credits for past impact fees paid shall be made or created. Permits picked-up on or after November 5, 2018 will be assessed new roads rate. Sec. 2-193. – Computation of amount. 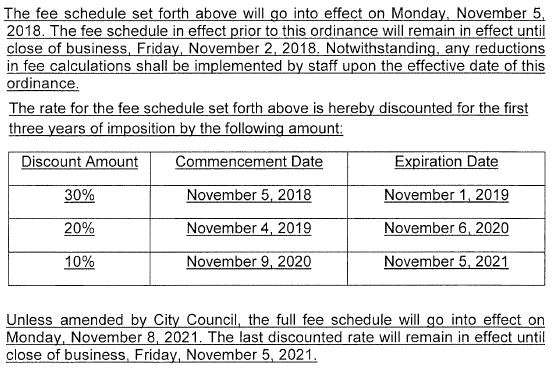 At the option of the feepayer, the amount of the roads impact fee may be determined by the schedule below. The reference in the schedule to square feet refers to gross square footage of each floor of a building measured to the outside of the exterior walls, and not usable interior, rentable, noncommon or other forms of net square footage. Gross floor area excludes structures parking (vehicular parking and loading areas). The reference in the schedule to recreational vehicles refers to the number of recreational vehicle sites which are permitted by the applicable final development order.